PAYMENT POLICY - PRINCESS CRAFT RV REQUIRES HALF OF THE TOTAL BALANCE BE COLLECTED AT THE TIME THE RESERVATION IS MADE. THE REMAINING BALANCE IS DUE 30 DAYS PRIOR TO SCHEDULED PICK-UP DATE. IF THE PICK UP DATE IS LESS THAN 30 DAYS, THE ENTIRE RENTAL FEE IS DUE AT THE TIME THE RESERVATION IS MADE. CANCELLATION POLICY - A FULL REFUND WILL BE ISSUED IF REQUESTED PRIOR TO 30 DAYS OF RESERVATION. A 50% REFUND IF REQUESTED WITHIN 30 DAYS OF RESERVATION. NO REFUND WITHIN 1 WEEK OF RESERVATION. IDENTIFICATION - A VALID DRIVER’S LICENSE MUST BE PRESENTED WHEN PICKING UP THE TRAILER. 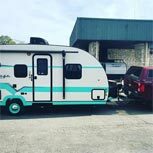 INSURANCE REQUIREMENTS - PROOF OF VALID INSURANCE FOR THE VEHICLE TOWING THE TRAILER IS REQUIRED AND MUST BE PRESENTED BEFORE THE UNIT DEPARTS FROM PRINCESS CRAFT RV. INSURANCE REQUIREMENTS NEED TO INCLUDE COMPREHENSIVE, COLLISION AND LIABILITY WITH A MAXIMUM DEDUCTIBLE OF $1000. RENTAL PERIOD - PRINCESS CRAFT RV HAS A 3-NIGHT MINIMUM DURING OUR RENTAL SEASON. EACH OVERNIGHT PERIOD COUNTS AS ONE NIGHT. PICK-UP AND DROP-OFF POLICY - PRINCESS CRAFT RV REQUIRES A SCHEDULED TIME FOR PICK-UP AND DROP-OFF. DURING THE RESERVATION PROCESS YOU CAN SET THE TIME THAT IS CONVENIENT FOR YOU. WE ASK THAT YOU ARE VERY PROMPT TO THE TIME YOU SET. WE SCHEDULE AN ORIENTATION FOR YOU AT THE TIME YOU SELECTED AND DROP OFF TIMES ARE IMPORTANT TO ENSURE WE CAN ASSIST OTHER CUSTOMERS. IF SCHEDULED TIMES ARE NOT MET YOU MAY HAVE TO WAIT UNTIL THE TECHNICIANS HAVE AN OPENING AND COULD BE SUBJECT TO A LATE FEE FOR DROP OFF. DUMPING POLICY - PRINCESS CRAFT RV REQUIRES ALL RENTAL TRAILER TANKS TO BE DUMPED AND RINSED OF ALL WASTE PRIOR TO RETURNING. WE DO OFFER DUMP SERVICES FOR A PREPAID FEE OF $250.00. YOU DO NOT NEED TO DRAIN AND REFILL THE FRESH WATER TANK. UPON INSPECTION, IF TANKS ARE NOT DRAINED AND RINSED A $250.00 DUMP FEE WILL BE CHARGED. CLEANING POLICY - IN ORDER TO MAKE YOUR VACATION HASSLE-FREE, WE OFFER A PRE-PAID CLEANING PACKAGE FOR 50.00. IF YOU DO NOT PURCHASE THIS OPTION, WE DO REQUIRE THE TRAILER TO COME BACK CLEANED AND IN THE CONDITION IT LEFT. OTHERWISE A $50 CLEANING FEE MAY BE CHARGED. PET POLICY - PETS ARE ALLOWED TO COME ALONG FOR A FEE OF $50.00. WE DO REQUIRE THAT ALL TRAILERS BE RETURNED IN THE SAME CONDITION AS YOU RECEIVED IT, FREE OF PET HAIR AND PET ODOR. SMOKING POLICY - SMOKING IS STRICTLY FORBIDDEN IN ALL OF OUR TRAILERS. IF THE TRAILER IS RETURNED WITH SMOKE ODOR A $200 CLEANING AND DEODORIZING FEE WILL BE CHARGED. TOWING POLICY - PRINCESS CRAFT RV DOES NOT ALLOW ANYTHING TO BE TOWED BEHIND OUR TRAILERS. NO EXCEPTIONS. ROOF ACCESS - ROOF ACCESS IS STRICTLY FORBIDDEN. THE ROOFING MATERIAL IS FRAGILE, AND CAN BE DAMAGED EASILY. BATTERY LIFE - WE SEND EVERY UNIT OUT WITH FULLY CHARGED BATTERIES. HOWEVER, DEPENDING ON THE USE OF YOUR 12V SYSTEM WE CAN NOT GUARANTEE HOW LONG THE BATTERIES WILL LAST. PRINCESS CRAFT RV OFFERS A GENERATOR THAT CAN BE RENTED IF YOU ARE CAMPING SOMEWHERE WITHOUT ELECTRICITY. IF YOU CHOSE NOT TO RENT THE GENERATOR, PRINCESS CRAFT RV IS NOT RESPONSIBLE FOR BATTERIES DYING AND WILL NOT GIVE CREDIT OR A REFUND. PROPANE/GAS - WE WILL INCLUDE FULL PROPANE BOTTLES AT TIME OF DEPARTURE, YOU DO NOT NEED TO REFILL THE TANKS. IF RENTING THE GENERATOR, WE WILL FILL THE TANK WITH GAS FOR YOU; HOWEVER YOU MAY WANT TO BRING AN ADDITIONAL GAS CAN IF YOU FEEL YOU WILL NEED IT FOR ADDITIONAL USE. GENERATOR DOES NOT HAVE TO BE REFILLED UPON RETURN. DAMAGE POLICY - YOU ARE RESPONSIBLE FOR ANY DAMAGES ON OUR UNITS WHILE IN YOUR POSSESSION. PRINCESS CRAFT RV DOES NOT COLLECT A DAMAGE DEPOSIT. IF THE UNIT RETURNED WITH ANY DAMAGE, THE DAMAGE WILL BE ASSESSED AND YOU WILL BE CHARGED ACCORDINGLY.